I'll continue to update this post with more details and information if I come across any. More to come once I finish combing over the Pet Journal. In addition to the removed pets listed above, there were some changes to previously implemented pets. A few had their source changed, and the pet that was originally known as Karabor Kid was renamed to Argi. It also received a small makeover and its model received some updates. Only one new pet was added this time, the Parched Lizard. It can be found as a wild pet in Gorgrond and uses the same model as a warp stalker. Speaking of wild pets, many wild pets were finally implemented and spread across Draenor. Wild battles now also consist of 3 pets instead of just 1. This should mean pet experience earned from grinding on wild pets will be the same in Draenor as in Pandaria. The vendor at the Menagerie inside your garrison had her stock updated. You can purchase a Mystery Bag for 2 Pet Charms and receive a random family-specific leveling stone. Unfortunately, she doesn't trade a Marked Flawless Battle-Stone for three of a kind anymore. If you're still in need of a specific family's quality upgrade stone and want to trade in three, you'll need to visit the Pet Battle trainer in Stormwind or Orgrimmar. We have confirmation on the still unconfirmed Blizzcon 2014 pet! Looks like it will indeed be Grommloc, currently named BC01 on the PTR/Beta. With WoD looming just around the corner and time flying by fast, I'm getting steadily more and more anxious about all of the pets that I'll need/want in the expansion. Currently there are over 100 new pets to collect. Meep. I've already listed the garrison buildings that collectors will be interested in, but here are some other "to-do's". Note: I'm unsure if the Sha'tari Skyguard is the same thing as the Sha'tari Defense, a new unlockable faction via the Trading Post building in your garrison. This building unlocks a horde faction (Laughing Skull) that sells a pet, so it would only make sense if there was an alliance one as well. However, the Sha'tari Skyguard is currently a faction that can be accessed by both horde and alliance (on live servers), so it's confusing that the pet is listed in the Pet Journal as something from the "Skyguard" instead of the "Defense". So much to do in the near future, ahhhh! "The 10- year anniversary celebration will begin in-game on Friday, November 21 and will last until Tuesday, January 6, 2015 at 10 a.m. PST." This gives us about 1 month and 2 weeks to collect all of the 10th anniversary pets. Hopefully that's more than enough time for everyone in the community. The second pet will require a bit more time (depending on your luck and the drop rate). Hatespark the Tiny is a drop from the last boss (Ragnaros) of a revamped 40 man LFR-styled Molten Core. According to developer Jeremy Feasel, it sounds as if the pet is not a 100% drop rate, and we'll need to kill Ragnaros multiple times before obtaining Hatespark. "Repeat MC runners will have a chance to get Hatespark the Tiny and the Flames of Ragnaros enchant illusion :)"
Personally, I'm not that thrilled. I'm hoping that since I'll need to repeatedly kill Rag, that the LFR version of MC will be split into wings. If it is, then I can queue for the last wing many times without having to go through the hassle of clearing the entire thing over and over again. I wouldn't have such a big problem with MC if I could put my own group together and run it with people that I know and trust to not be dead weight in a raid. But I've yet to come across a solid LFR group made up of nearly all random people, that's performed well. Add to this uncoordinated and unorganized set of people a lengthy raid that's been revamped to match our current level, and ouch. Plus the RNG droprate of the pet and limited availability. It might be a painful experience rather than an enjoyable celebration of 10 years of WoW. We'll see. Both pets will only be available during the aforementioned dates. That is, once the 10th anniversary celebration is over, the pets will not be obtainable anymore. Only Hatespark, who is cageable, might occasionally be on the Auction House post-anniversary. So remember to log in to at least collect your Molten Corgi! Edit: I completely forgot to mention another detail that shouldn't be overlooked; you need to be level capped to participate in the LFR version of MC. WoD will be released November 13, so if you want to be able to participate in the "new" Molten Core immediately, you'll need to power level and be 100 in 8 days. That's a tall order for some players, especially for those that may want take multiple characters to the raid. With this additional information, I'm not sure how I feel about the pet not being 100% drop rate. There will be a lot of pressure on collectors to reach the appropriate level and then overcome the RNG in a 40 man pug. All within about a month. Yikes. I think it's about time we talk about the giant elephant in the room (and I don't mean the Elekk Plushie). WoD pet battle content is shaping up quite nicely, however new gated content was recently implemented for beta testers to test out, and let's just say it doesn't seem very well received so far. There are many pet-related activities that are locked behind a number of tasks, but this one might just be overkill. To unlock the level 3 Menagerie blueprint, we'll have to battle one thousand (1000) pets. In Draenor. Not in Pandaria, not in Azeroth or Outland. Only in Draenor. And it's something you won't want to skip. Why? Because the level 3 Menagerie unlocks a new daily that rewards a bag which may contain one of a handful of pets each day. It's THE good stuff, and everything we've been and will be working for — new pets. While I don't mind gated content or grinds, this achievement has a few issues. Nevermind the fact that many players will see 1k battles as excessive, but what exactly is there to battle one thousand times in Draenor? There are only six Draenor trainers, which you can only battle once per day each. There's only one Menagerie challenge, that we'll likely be able to battle only once per day once WoD is released (despite being able to challenge it repeatedly on beta). That leaves wild battles to grind out that enormous number. Granted, we'll be battling wild pets regardless if there are other, more interesting things to battle. We'll be hunting for all of the new wild pets in different breeds and qualities. But there are still limits to how many new wild pets there are, and eventually we'll reach our collecting goal long before the 1k mark is met. After that, it will be just a straight grind. Which again, I don't mind. However, considering the state of wild battles on the beta at the moment, I'm not looking forward to it too much. As a disclaimer, beta is beta so content may not yet be finalized. Currently many of the wild pets are still missing from the world, or at least one would hope. Draenor is largely devoid of any wandering pets, and they can only be found in large packs in Nagrand. Depending on the density and spawn rate once WoD is released, the competition for wild pets could be high. Not just for the new pets, but also for the achievement to unlock the next level of the Menagerie. That doesn't sound very fun. Plus, wild battles on the beta are currently single pet fights. I'm unsure if this is intended or if two other pets will eventually join the wild teams, but I'm torn between rooting for one or three. But let's give it the benefit of the doubt. WoD will have a plethora of wild pets, and the repsawn rate will be balanced enough so that collectors will have more than enough fill of new pets and wild pets for battle fodder. There are still concerns that surround this overwhelming achievement we have to complete. "And, I have to do 1000 Draenor pet fights before I can actually start getting the most relevant reward from beating Draenor pet fights? This is akin to forcing people to get a "defeat Garrosh 10 times" achievement before they can get loot from Garrosh." As Poofah mentions on WarcraftPets, other than for collecting the new pets, wild battles have no real value in terms of progression. It's not something that's new or will teach a seasoned battler anything. The level cap hasn't been increased, so the wild pets in Draenor are essentially the same as those in Pandaria. Minus a few new faces. The gating is a grind for the sake of a grind, it would seem. Also unlike the Pandaria wild pets, Draenor ones are pretty undesirable for leveling too. If they remain single pet fights, Draenor wild battles will yield much less pet experience than a wild team of three. 319 experience for a level 1 pet in Draenor (with Safari Hat), compared to 798 experience for a level 1 pet in Pandaria (with Safari Hat). As long as Draenor pets are fighting solo, we lose any benefit to battling them. But again, I'm torn between wanting teams of three as opposed to a team of one. With such a huge number as one thousand looming over me, a single pet fight goes much faster. However, I lose much of my motivation to battle wild pets in Draenor since my pets don't receive nearly as much pet experience from single pet fights. So it's a lose lose situation either way. Increase the teams to three pets for full pet experience, it takes longer to reach that 1k goal. Keep the teams as a one pet encounter, but lose the leveling benefits of Draenor wild battles. On top of that, this achievement basically locks us in Draenor. Battles elsewhere won't count. They must be completed within the new zones in the expansion. But outside of new pets to capture, there's very little appeal to staying in Draenor for wild battles. Why stick around when I can earn more levels (AND rewards) battling previously implemented trainers? Because I'm forced to participate in Draenor-only battles for the sake of "progression", despite there being no new/additional benefits. As things stand, it's actually more of a disadvantage. I don't think I need to mention travel time, do I? Well, I'll touch on that. Nevermind getting from zone to zone, just running around on a ground mount was tedious. Without flying in Draenor, finding pets could eat up the majority of our time. Playing on my level 100 on the beta, it was a chore to find wild pets that weren't guarded by high level mobs (because clearing out an area of mobs means MORE time spent doing something other than pet battling). It was tough to just battle without having to waste time traveling or dodging other things. What will this mean for collectors who can't spend many hours a day looking for battles? I spent a good 3-4+ hours a day over the course of 2-2.5 days just to earn 500 Draenor battles under my belt. Not everyone has that kind of time. I even got lucky and there were multiple restarts throughout my play time, which reset the wild pets and spawned them all back in fairly quickly. It could take weeks or months for the average collector to finally unlock the level 3 Menagerie and reach that last step of Draenor pet battle "progression". But by then, who knows? Will newer content be out and will those players feel left behind? It's discouraging to think about and may put off some collectors. To play devil's advocate, completing this 1k achievement will go to those that truly immerse themselves into pet battling in Draenor. It's not a task that involves a lot of skill or knowledge, but it is something that not every player can accomplish right away. It will mark a very dedicated collector (or someone with a ton of free time on their hands), and perhaps it should initially be reserved for only such persons. They will likely collect the new pets from the level 3 Menagerie daily quest before others, and they'll have a small window in which parade their new pets around and to shine as a special snowflake. The Solution? Is There One? Should the gated content be removed entirely? My opinion is no. Having a long-term goal is good not only for us as players, but also for the game. It gives the gameplay longevity and something for us to look forward to. 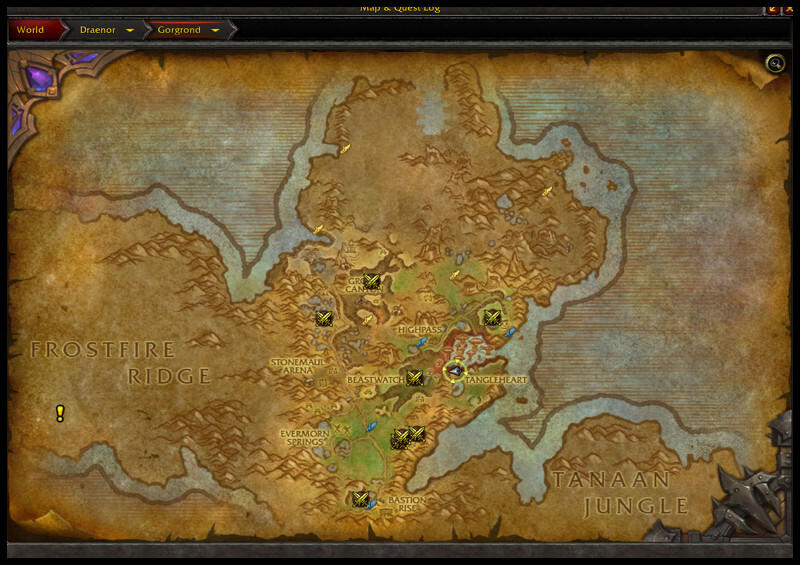 As it is now, though, 1k Draenor battles is NOT something many will look forward to. Taking into consideration all factors mentioned above, perhaps simply lowering the number required to unlock that last, more desirable step in pet battles progression, would be the best course of action. 500 Draenor battles? I managed to achieve that in 2-2.5 days. 750? That could be doable over the course of a week for your average collector/battler. Compared to the majority of other garrison achievements that unlock other level 3 building blueprints, the Menagerie one just seems out of place. 500 Draenic Stone for Mines level 3 and 500 Draenic Seeds for the Herb Garden level 3. Admittedly, the Fishing Shack achievement that unlocks its upgrade does sound extreme (100 of 7 different fish, 700 fish total), but keep in mind that while working towards that achievement, you're gathering NEW resources that you can and will use to further other professions. You're not grinding for the sake of grinding; you're progressing forward and are rewarded for your efforts. The wild battles in Draenor really don't offer much in the same way. Perhaps awarding more pet experience for completing a wild battle in Draenor is another option. It would certainly make the grind more appealing, but some would still contend that 1k is just too much to be fun. For some veteran collectors, there are only so many new pets that need to be leveled. And with the implementation of the leveling stones, that process will go even faster. It's only one pet level per stone, but that takes away the need to grind experience out. In the end, my impression thus far is that one thousand Draenor pet battles is too much. Gating is fine, but it should be more logical. Wild battles are so yesterday, and there are no new or additional benefits. How does it prepare us for the next step? It doesn't, really. Perhaps the level 3 Menagerie should be gated behind defeat X trainers X number of times. Or defeat X trainers with X pets. Or defeat X trainers within X number of rounds. The simplest and most straightforward change I can think of, though, would be to reduce the number of Draenor battles required to unlock the level 3 Menagerie. Thanks to @patf0rd we now have some insight on what you earn by defeating all of the Draenor trainers. Once you've completed the achievement Taming Draenor AND have a level 3 Menagerie (blueprints for a level 3 menagerie require the achievement Draenic Pet Battler), you'll unlock a new daily quest inside your garrison called "Mastering the Menagerie" (NYI on Wowhead). The objective of the daily is to defeat all 6 trainers. It will reward a Big Bag of Pet Supplies which contains charms and the family-specific leveling stones. Plus, it might drop some new pets! Well, at least according to the Pet Journal. There are a handful of pets that are rewarded from the quest "Mastering the Menagerie". A big thank you to patf0rd for sharing this info with me and testing all of this out! Edit: List of all the pets that are currently listed in the beta Pet Journal as a reward from "Mastering the Menagerie". There's a total of 7. Anyway, there was a beta patch yesterday and it wasn't huge but some updates were pretty significant in my opinion. We've got two new pets, a new achievement, and two achievement updates. There were also slight changes to the Draenor trainer rewards and the vendor located at the menagerie in your garrison. Second new pet is tied to an updated achievement, An Awfully Big Adventure. Defeating FORTY-FOUR trainers (spread out all over Azeroth, Outlands, Northrend, Pandaria, etc.) with the Elekk Plushie on your team will now reward your efforts with a pet, Trunks (a new baby elekk). Yes, you read that right. 44. That's...a lot of trainers! But for many battlers, it should be a piece of cake. The most annoying portion of this achievement might be the travel-time. And probably the Celestial Tournament since the achievement requires all of the rotating initial 3 trainers. Speaking of updated achievements, though, another one was changed. Previously, Victory in Hillsbrad rewarded Hogs, but no more. Now you get a title (corresponding to your faction) when you complete this achievement. Aside from the changes, there's a new achievement for defeating all of the Draenor trainers. Taming Draenor will unlock "Draenor Pet Battle Daily Quests". I'm still not sure what the daily quests will consist of, though. Is it a new daily quest? Or something we've already had a chance to test? Is it tied to the level 3 menagerie or maybe it's something else? There are still a handful of pets that are rewarded from the quest "Mastering the Menagerie" (quest NYI), so maybe the achievement unlocks that? We'll see. I'm having a hell of a time trying to even complete the achievement on beta. With disconnects and the world going down constantly, it's been slow going. Not to mention my menagerie is still only level 2, so I can't even check level 3 if there's anything new once I've completed the achievement. Hopefully someone else will have the time and patience to see what this is all about. On the topic of Draenor trainers, their rewards were changed slightly. Instead of receiving Pet Supplies, battlers will get some gold and 4 Pet Charms from each trainer. Before, the bag contained some charms as well as a family-specific leveling stone. In news related to this, the vendor at your menagerie now only sells Flawless Battle-Training Stone instead of both the generic one and family-specific ones. The flawless one costs 2 charms each, so if you battle all 6 Draenor trainers each day, you can purchase at max 12 stones per day. This value is subject to change of course. I'm actually ok with these changes. Rather than juggling 11 different family-specific, soulbound stones, we'll only need to deal with one all-around useful one. Save some bag space, save some headache! It does take away a little of the excitement from the trainer rewards, though. With a bag, there was anticipation whether or not there's a new pet inside. Now we won't have to worry about grinding those dailies every day for a new pet. Instead we'll be grinding away on those dailies for battle-stones lol. But I think I'll be happier with a guaranteed stone than an RNG drop pet heh. There's still a chance we might see more of the leveling stones and a new reward bag from some other reward in a future content patch after WoD's release. I wouldn't count it out, at least.